Even a cursory search of the Internet yields many surprising discrepancies that totally destroy the official fairytale that has been literally shoved down our throats for years. But this knowledge could only be achieved if we are wise enough to disregard, or avoid, the twisted lies of the mainstream news media. If so, then it comes as no surprise. We already know it was an inside job. 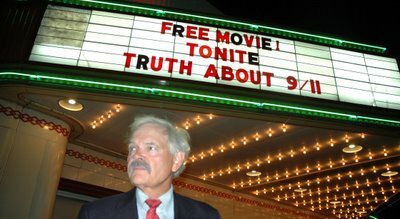 In a 90-minute multi-media presentation geared toward scholars, engineers, scientists, and emergency responders, Air Force veteran and KYRS radio host Mike Kress ("Take the Power") will review relevant events in US history and show the World Trade Center-based documentary "September 11th Revisited". The goal of this seminar is to foster discussion among professionals in the Spokane community who could most benefit from researching the events of 9/11 and deciding for themselves if the official account is true. Mike's guests on "Take The Power" have included such 9/11 Truth researchers as David Ray Griffin, Webster Tarpley, Loose Change 2nd Edition producer Korey Rowe, and LC2E writer/director Dylan Avery. Professor: Twin Towers Should have "Withstood Burnout"
A professor of fire safety engineering says that the Twin Towers should have "withstood burnout" after they were hit . Jose Torero, professor of fire safety engineering at the University of Edinburgh, conducted the experiment on a 24-storey tower block in Dalmarnock. He also hopes it will shed light on why the Twin Towers collapsed on 9/11. Prof Torero said he believed the World Trade Centre in New York should have "withstood burnout" after it was hit. The collapse of the towers in September 2001, after they were hit by hijacked aircraft, resulted in the deaths of almost 2,800 workers and 350 firefighters and emergency workers. O'REILLY: Of course, that's nuts. But university Provost Patrick Farrell says Barrett can continue teaching, and he's going to teach a class on "Introduction to Islam." Former NSA Director: "By any measure the US has long used terrorism"
This essay seems to be going over well with people afraid to look at the facts surrounding 9/11. It documents false flag operations by the U.S. government, but deletes all mention of 9/11 and Pearl Harbor, two issues that seem to illicit knee-jerk reactions and close-the-gate defensiveness in alot of people. If you need to educate someone about false flags before they're ready to hear about 9/11, this might be a place to start. The city is using a big slice of the $1 billion it got from the feds post-9/11 to fight first responders who claim they got sick on the site, a lawyer who is suing the city charged yesterday. David Worby, who is waging a suit on behalf of 8,000 WTC responders and their survivors, said $20 million has been "spent on city lawyers to deny the claims of cops, firefighters and others who were sickened." "That money should be used to help these people," he said. "Take $100 million from the billion, Mr. Mayor, and set up a proper registry" to monitor the health of those who toiled at Ground Zero. Update, watch online (C-Span 1)here. Alberto Gonzalez, the U.S. Attourney General, will be on C-Span Washington journal at 9 am (EST). We can nail this guy and get to see his facial expression and reaction. I intend to call in and ask him, the head of the U.S. dept. of Justice, why the FBI is claiming that the reason why OBL is not named for the 9/11 attacks on their website is because the dept. of justice has determined there is no hard evidence connecting OBL to the 9/11 attacks and therefore they cannot even assemble a grand jury to look at evidence and present charges. Jeez, what a busy night. We posted somewhere around 15 articles today, a majority of which came after work hours, so be sure to scroll down and check out a bunch of new stuff from this evening. We also received around $350 today to go towards running an ad on rawstory.com for the upcoming airing of the L.A. panel on CSPAN, including one very generous donation (thanks man). I was going to go ahead and front the rest and put the ad up, but when I checked the CSPAN schedule I didn't see the event listed for the 29th any longer - am I just missing it? Contact CSPAN and see if the L.A. panel airing is still on for the 29th at 8PM, and if you get any confirmation please let us know. David Ray Griffin, a retired Professor of Theology addresses this question in his two books that critically examine the official account of the events of 9/11. 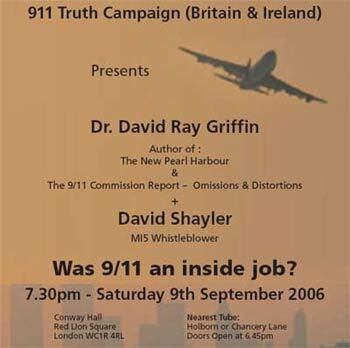 Now for the first time in the UK, David Ray Griffin will present his case for the urgent need to re-open the investigation into the events of September 11th 2006.